Google, Microsoft, and Amazon are all gadget-makers now. Samsung, which has always made software, is talking about making its own mobile operating system (a “fork” of Android). Want to know why this is all happening? Look at this incredible compilation of charts from Horace Dediu. On the first row, you can see that hardware makers Apple and Samsung have much bigger revenues than Google, Microsoft, and Amazon – software-makers and services-providers. 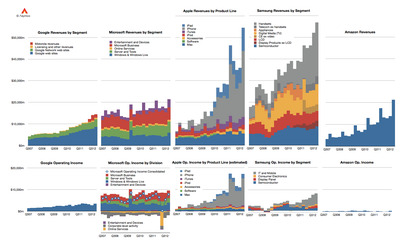 On the second row, you can see that hardware AND software maker Apple has a much bigger operating income than Samsung, which just makes hardware, and Google, Microsoft, and Amazon – which just make software or sell software-based services.